John Annesley Company offers normal duty wood-keyed stretcher bar solutions in four varieties of depths and configurations. All our stretcher bars are made from solid basswood which is a very light weight and straight grain hardwood with an almost neutral PH. 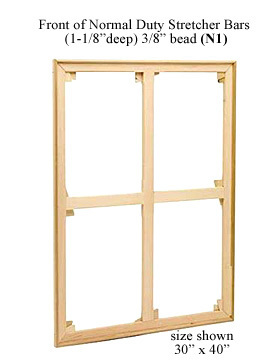 What this means is that the stretchers are light, strong, guaranteed to be warp free, and are much less likely than stretchers made from others woods, to react with paints in any negative fashion. Solid wood construction; no finger jointing. We can shellac seal the stretcher bars if your process benefits from this. 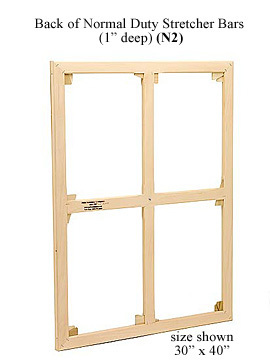 Plus we provide a variety of edge treatments for our stretchers, allowing for a variety of framing options and painting techniques. Much like a human face, the fabric on stretcher bars is effected by gravity and sags over time. Both linen and cotton duck show their sensitivity to heat and cold by expanding and contracting. This happens twice a day or more in most environments. Over time, the fabric fatigues and begins to loose its resiliency. Traditionally, the wooden keys hammered into the corners of the stretcher bars have been used to further expand the bars and take up the fabric slack. Wooden keys allow conservators the choice of direction in expanding the bars. Our most popular normal duty stretcher bars, the Thin Wraparounds (N3) are strong, museum quality stretchers with a 1-3/4" depth profile. The design of the bars is an interlocking t-section created by insetting, glueing and nailing the inner and outer pieces of wood together. This design makes an extremely rigid stretcher with three times the tensile strength and warp resistance of a single length of wood. 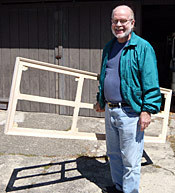 The front face of the "T" design has a beveled edge which raises your art fabric 5/8" off the face of the stretcher bars. A 3/8" recess in back of the stretcher makes it easy to tack art fabric edges, allows for tighter corners, and the space to inset of a backing board, while still maintaining room for a hanging system. 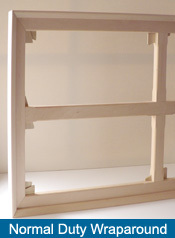 There are double slip mortise and tenon miter joints in each corner, plus mortise and tenon bracing. Braces are 3/4" X 1-3/4". Like all our products, the Thin Wraparound is made from kiln-dried basswood, beautifully crafted to exacting tolerances. 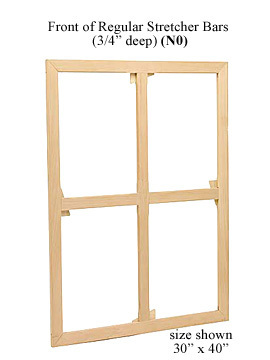 These stretcher bars are totally free of knots and other physical defects. 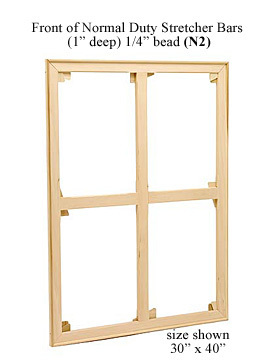 All joints are expandable through the use of traditional wooden-keyed system. We custom build all our stretcher bars to standard, fractional and metric sizes; Heavy Duty Stretcher Bars and mMuseum Bars can go up to 40 feet! N1 1-1/8" deep, N2 1" deep, N3 1-3/4" deep, and Reg 3/4" deep. 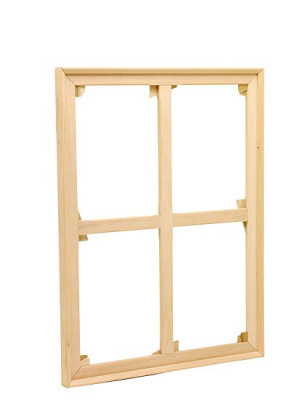 This option allows for a wide variety of framing options due to its 1" profile depth. It was developed specifically for restretching existing paintings and is often used when there is limited excess art fabric to stretch with or to use as a tacking edge. 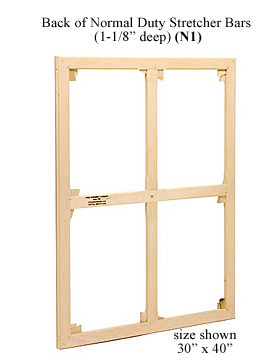 The 1+3/4" depth of our normal duty stretcher bars is designed as a T section for great strength, and is designed to have fabric stretched around the sides and tacked in the back, eliminating the need for framing. (We do make a wide variety of floater frames that work with these). 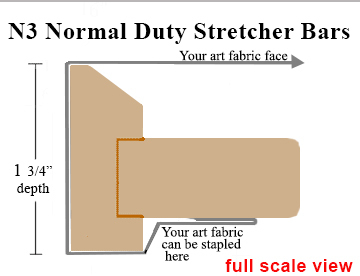 Artists who use a moderate to heavy touch in their painting techniques should consider using this profile which provides 3/4" of space between the fabric and the bars and braces. All corners and braces are keyable with supplied wooden keys. 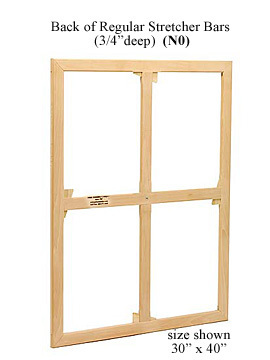 Provide the thinnest depth available at 3/4" profile thickness, and are appropriate for smaller paintings. We bevel the 3/4" bars and braces are 5/8" thick instead of 3/4" Wooden keys at all corners and braces, mortise and tenon bracing joints.